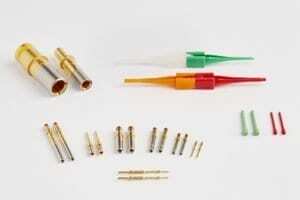 Contacts, filler plugs, insertion and removal tools available for Mil spec and commercial connectors. M39029 contacts are designed and manufactured to military standards for application in a broad range of popular Mil spec and commercial equivalent connectors. These include: MIL-DTL-5015, MIL-DTL-26482, MIL-DTL-83723, MIL-DTL-38999 and others. Also available for HYPERBOLOID contacts. Their advanced design satisfies performance requirements previously considered impossible allowing high current and extended life giving the highest standards of performance. Please contact your Sales Manager for more details.